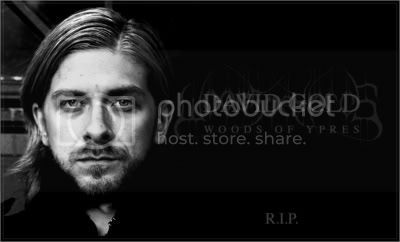 WOODS OF YPRES frontman David Gold was tragically killed in a road traffic accident on December 21st, 2011, outside Barrie, Ontario, in his home country of Canada. In accordance with the wishes of David's family and band mates, the recently completed album Woods V: Grey Skies & Electric Light will be released, as planned in February. The Gold family issued a statement for David's friends and fans as follows: "The Gold family is incredibly saddened in the wake of David's sudden passing. We want to thank everyone for the ongoing outpour of support, as it is greatly appreciated. Although he was only 31 years old, David lived more than most would be able to in an entire lifetime. He was well educated, well travelled, incredibly talented, passionate, compassionate, and loved dearly by thousands of friends, family, and fans all over the world. David's legacy will not only live on, but continue to grow. We ask you to keep David's spirit alive by continuing to listen to his music, and let him inspire your life." Donations can be made to support his funeral costs through his Paypal account at davidypresgold@gmail.com. 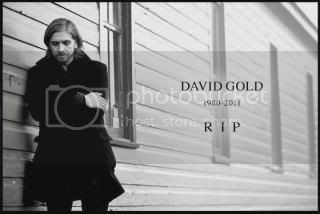 Joel Violette was David's band mate and long-time collaborator, he had the following statement: "I am completely shocked and utterly at a loss for words about David's passing. I write this with a very heavy heart, and I can only imagine what David's family is going through, as well as the rest of his friends. My heart goes out to them all. This tragedy comes at a truly inopportune time for Woods of Ypres, though there is never an opportune time for these things to happen. We'd booked to tour Europe in support of Woods 5, we'd recruited the talented Rae Amitay and Brendan Hayter, and we were only waiting for January rehearsals before setting off. We had an exciting album to play and exciting places to play it. It's hard to say what is next for Woods. David was unequivocally the voice, heart, and soul of the band. In the last year or so David and I planned out many projects for Woods of Ypres in great detail. It would be a shame for none of them to come to fruition, and David would have wanted his fans to hear them. So I will examine these, discuss them with Earache, and endeavour to complete what can be completed given the circumstances. David was always and still is the essence of Woods of Ypres. So if and when any Woods projects come to light, it will be with this fact firmly and unwaveringly in mind. For the present time my immediate task is to promote and release Woods 5: Grey Skies & Electric Light. We finished the audio portion in August at Beach Road Studios, and David D'Angelo finished the stunning album art last month. All that remains is press and promotion for the album. And I'm more than willing to do my own share as well as David's, with the same passion, enthusiasm, and good humor David would have had. So please direct any interviews to me, and I will be thrilled to answer questions. It was an honour to have worked with David, an honour to have shared the stage with him, and an honour to have spent a summer writing and recording with him. He was an extremely talented, driven, and generous man. He will be sorely missed." Earache will be working closely with David's family moving forwards, and join the hundreds of fans around the world that have offered their condolences to the Gold family. To leave messages of remembrance, memories or comments, please go to the Facebook tribute (run by David's family and Earache Records). Read BW&BK; scribe David Perri's tribute to Gold here. Fans can pre-order the Woods 5: Grey Skies & Electric Light "ultra limited" double LP or regular CD from the Earache Records UK-based webstore. A free album artwork posted is being offered with the purchase of the CD. Go to this location to place your order.